The car is worth $140,000. This car was destroyed by fire. Last week, Rahul Patel, of Newington, took possession of a car that would make most people salivate. 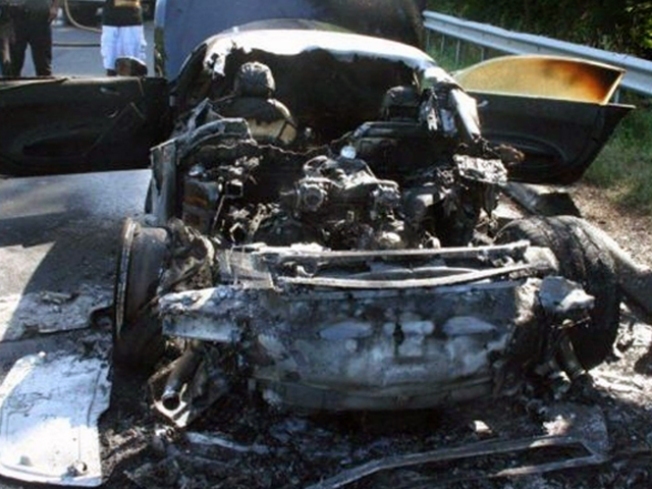 On Monday morning, his new $140,000 car burst into flames on the Merritt Parkway. Patel, who won millions in the Powerball lottery last June, was driving the Audi R8 in Fairfield around 9 a.m. on Sunday morning when he saw smoke coming from the back of the vehicle, the Connecticut Post reports. That is where the engine is located, according to a description of the car on Audi’s Web site. Patel pulled over to check on his new car. When he stepped out, he saw flames from the engine area, the Post reports. Patel was not hurt, but the car was destroyed. Patel won $25 million on a Powerball quick pick ticket on June 27, 2009 and chose a $12.5 million cash payout. He was the only winner. The staring price of a new Audi R8 is $114,200, according to Audi’s Web site. Fire officials told the Post that the car was valued at $140,000, with options. The Fairfield Fire Department is investigating the cause of the fire.